When Will What We Know, Change What We Do? Why doesn’t science, research and coaching best practices drive our youth sports model? Sadly, it’s because youth sports and physical movement education have become, in far too many cases, more about the needs of the business of sport than the needs of the child in sport. When over 70% of kids quit sports before high school, it is their way of telling us that this model is not working for them. It is time for what we know to change how we do things in youth sports. We know that playing multiple sports and getting adequate rest and time off is a key component to preventing injury and burnout. (click here for American Society for Sports Medicine position statement). We also know that in many sports less specialization prior to the teenage years is a greater predictor of elite level performance. Sadly, what we do is continually force children to specialize far too young, increasing the dropout rate and resulting in an up to 70-90% higher injury rate according to this recent study by Neeru Jayanthi. What we know is that autonomy, enjoyment and intrinsic motivation are critical components of long-term sport performance, according to researcher Joe Baker, author of the critically acclaimed book Developing Sport Expertise. What we do, all too often, is take these away from kids. We limit a child’s ability to try many sports by forcing him or her to choose one far too early. We focus on outcomes (did you win?) instead of enjoyment (are you having fun?). As a result we prevent kids from developing the intrinsic motivation to continually improve, and to be driven to succeed without us having to even ask. What we know is that a coach’s words can leave a lasting impact on a young athlete. A coach’s influence is never neutral! We must be intentional about everything we say and do with kids. Sadly, what we all too often do is allow coaches to treat young athletes in a way that we would never allow a teacher to treat a child. We allow poorly trained and behaved coaches to continue to work with kids, even after numerous incidents of poor behavior, because they win a few games. We allow coaches who are demeaning under the guise of being demanding. And, as author Jennifer Fraser found in her great book Teaching Bullies, we even ostracize the children and parents who try and stand up to coaches who treat others poorly. What we know is that no young athlete says “I love it when I can hear my dad yelling at the officials.” We know that the vast majority of kids, when asked “what would you like your parents to say on the sideline of your games, emphatically say “NOTHING!” What we do is attend our children’s games, coach them on every play (“Pass, shoot, hustle!”) and disrespect officials, often over inconsequential calls. Then we become outraged when children disrespect other authority figures in their lives and ponder “where did they learn that?” Spend a weekend on the sports field. Kids hear what we say, but they imitate what we do. What we know is that research says the #1 reason athletes play is “FUN!” Though an 8-year old might have a different definition of fun (learning new things, being with my friends) than an 18-year-old (being pushed to be my best, high-intensity competition), they still speak to the importance of enjoyment. What we do too often is take the “play” out of playing sports, and say “we are here to work.” Kids don’t work sports; they play them. What we know is that randomized, games-based learning promotes creativity, decision making, assessment and more transferability to competition. What far too many coaches still do, unfortunately, is promote blocked/massed practice, endlessly repeating the same technique over and over to “get our touches in.” It’s not that this doesn’t have some effect, simply that it’s about the least effective way to make use of your limited team training time. What we know is that clubs who follow a proper athletic development model, and craft a mission statement and values focused on developing the person, not simply the athlete, will create more loyalty and greater player retention than those who do not. What we often see are organizations that pay lip service to child development and values, and do not hold parents, coaches and athletes accountable for upholding those values. What a huge abdication of responsibility and lost opportunity to really make an impact on kids. What we know is that sport development is all about the process and long term focus. There are no overnight successes. Failure and adversity are all part of the process and focus on excellence. Sadly, what we do is operate out of fear. We get caught up in short term outcomes (did we win this weekend?) vs the focus on continuous improvement (what did we learn from losing that will help us get better?). Finally, and most importantly, what we know is that what our children need most, after a tough game, is something to eat and to know that we love watching them compete and play. They don’t need a critical recap on the ride home. They don’t need their coach’s decisions questioned, or teammates criticized. Just love them, unconditionally, and take into account their state of mind before you offer up your thoughts on how to get better. When will what we know change what we do? How long can we keep ignoring the research and evidence on sporting best practices? Change will happen when great parents and coaches stand up and build youth sport organizations and school programs that serve the needs of the kids. Change will happen when the silent majority take a stand against the vocal minority of adults who care more about the bottom line than the welfare of children. Let’s align what we know and what we do. Our kids deserve it. Changing the Game Project is a site that is your one stop shopping for the latest and greatest information, research, and best practices regarding high performance, motivation, Long Term Athletic Development, fitness, nutrition, college recruiting, and more. 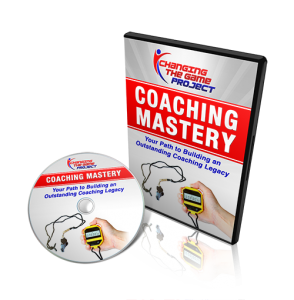 Coach Sullivan is offering a FREE video series which is part of his Coaching Mastery program which includes motivational and team building techniques used by some of the top coaches in the world. To gain access to his free video series click the link below or the image at the left.